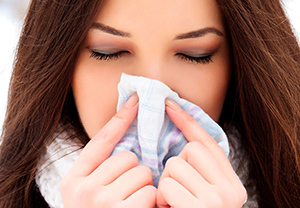 Numerous herbs and supplements can help in preventing allergy symptoms. Allergies can be downright cruel. Just when the weather perks up and the birds are chirping, allergy sufferers are bombarded with a host of allergy symptoms, which can range from inconvenient to dangerous. It is one thing to stuff tissue into every pocket available, but an allergy attack can leave some people gasping for air. Millions of people struggle through allergy season, with the majority reaching for over-the-counter (OTC) allergy medications like Benadryl® or Zyrtec®. Allergy symptoms are nothing more than the immune system overreacting to a trigger like pollen, pet dander or mold. When one of these intruders makes its way into the body, the response should be mild, like a few sneezes to expel the substance. Allergies become problematic when the immune system launches a full-on assault. Since the real reason behind unbearable allergy symptoms is a malfunctioning/overreacting immune system, treatment should focus on regulating the immune system, instead of trying to quiet the symptoms. Numerous herbs and supplements can help in preventing allergy symptoms. The recommendations below may seem daunting at first, but a few simple lifestyle changes can be very beneficial in managing and preventing allergy symptoms. Supplements are not one-size-fits-all. Speaking with a knowledgeable physician will allow precise dosage recommendation and monitoring. Keep in mind that some allergy symptoms can be life-threatening and will require physician supervision. Stinging nettle — When the body releases histamine and other chemicals, a series of reactions occur that are intended to help purge the body of the allergenic intruder. Stinging nettle is a great alternative to an antihistamine, as it actually inhibits the body’s ability to produce histamine. This plant delivers exceptional results without the unwanted side effects, such as dry mouth and drowsiness, that are often experienced with OTC medications. Studies have shown that taking about 600 mg two to three times daily is extremely effective in preventing symptoms. Divided doses are recommended since relief typically lasts about four hours. Quercetin — This bioflavonoid is a natural plant-derived compound that helps soothe mast cells (the cells responsible for releasing histamine) and prevents them from producing histamine. This multitasker is also a natural antioxidant that helps destroy free radicals, which cause cell damage, promote disease and accelerate aging. Citrus fruits, onions, apples, parsley, tea, tomatoes, broccoli, lettuce and wine are naturally high in quercetin; however, allergy sufferers will need higher amounts than what is provided by foods. Take this supplement about six weeks before anticipated symptoms. Quercetin should not be taken with food. Most people have found relief with two daily doses of 500 mg.
Omega-3 fatty acids — Multiple studies have found that participants who ate foods rich in omega-3 fatty acids were less likely to suffer allergy symptoms than those who did not. These specific fatty acids help address allergies in two ways. One, they have anti-inflammatory properties, which help reduce the inflammation in the sinuses caused by the allergic reaction. Two, they help support a healthy immune system. By regulating the immune system, any allergic response can be prevented before it is allowed to cause havoc. Take about 1000 mg of omega-3 fatty acids three times a day while struggling with seasonal allergies. Cold-water fish, walnuts, flaxseed oil, grass-fed meat and eggs are great food sources as well. Peppermint tea — Not only tasty, this tea’s benefits extend well beyond its delicious aroma. The peppermint essential oil acts as a decongestant to help open up nasal passages. Peppermint also contains anti-inflammatory and mild antibacterial properties. As with all supplements, quality has a significant impact on their effectiveness. Probiotics — Good bacteria is absolutely essential for a healthy immune system, but taking a probiotic can also help prevent and/or lessen allergy symptoms. These beneficial bacteria help reduce the level of histamines produced. Evidence is emerging that shows the correlation between the level of a mother’s gut bacteria during pregnancy and the child’s probability of developing allergies. Many quality probiotics are available; however, probiotics can be obtained from certain foods. Fermented food and drinks like kombucha, kefir and unprocessed sauerkraut help maintain a healthy level of good bacteria. Probiotics should also be taken following a course of antibiotics. AllergyEasy® — If life already feels too hectic to add the above suggestions, other options are available to desensitize the immune system so it does not overreact when a pollutant is detected. AllergyEasy is a program that takes place at home over several months to slowly introduce miniscule amounts of substances that cause allergic responses. This approach gradually exposes the immune system to larger amounts of allergy triggers so that, in time, the immune system recognizes them as harmless. The program is similar to allergy shots, but without the weekly doctor visits for injections and without the risk of a severe, dangerous allergic reaction. AllergyEasy consists of a few sublingual drops under the tongue daily. The drops are all-natural, safe for young children and will not interfere with other supplements or medication. Most people notice considerable improvement in their allergy symptoms or total prevention altogether within six months. Paul Stallone, N.M.D., founded the Arizona Integrative Medical Center, located in Scottsdale, Ariz. He combines natural, alternative and conventional treatments to fit each patient’s needs. drstallone.com or 480-214-3922.